In SSMS,you can see dependencies created for view created in one database & tables in another database on which view refers ,as shown in below image. Step 1: Create table with one column referencing two other column in same table. 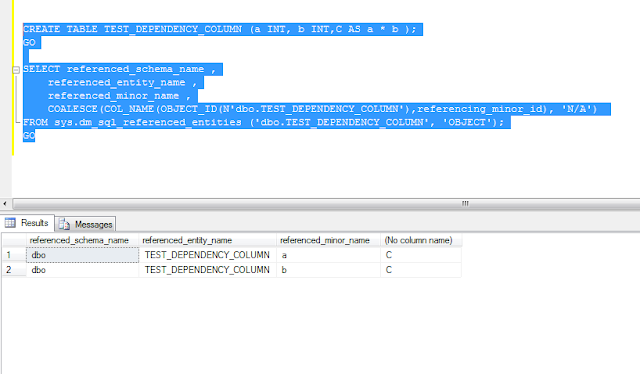 Note: referenced_minor_id = Column ID when the referenced entity is a column; otherwise, 0. Note: sys.dm_sql_referenced_entities system function will report any column-level dependency only for schema-bound references. 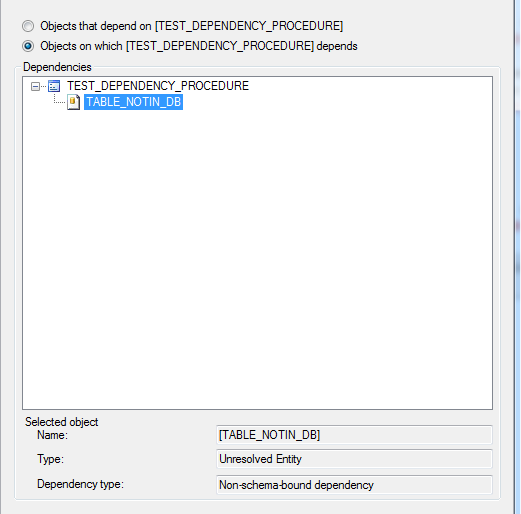 Step 1: Create procedure with table that does not exists. Step 2: Execute below queries to check referencing & referenced objects by using sys.dm_sql_referencing_entities & sys.dm_sql_referenced_entities functions. You will get below error message, because table does not exists in the database. 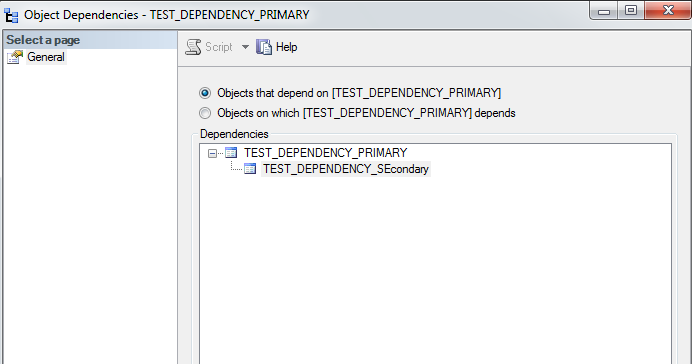 The dependencies reported for entity "dbo.TEST_DEPENDENCY_PROCEDURE" do not include references to columns. This is either because the entity references an object that does not exist or because of an error in one or more statements in the entity. Before rerunning the query, ensure that there are no errors in the entity and that all objects referenced by the entity exist. Also in SSMS, under View Dependencies, you can notice Type as “unresolved entity”, Which means object does not exists. After creating table, check referencing & referenced objects by using sys.dm_sql_referencing_entities & sys.dm_sql_referenced_entities functions.